Free shipping for this Lifetime shed shelf accessory when shipped to the lower 48 United States. 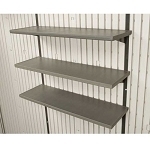 Easily add more storage to your lawn and garden shed with this full-wide shed shelf. Please note that on an 8? shed you can use a total of 4 of these shelves. They only work on the 8? side. 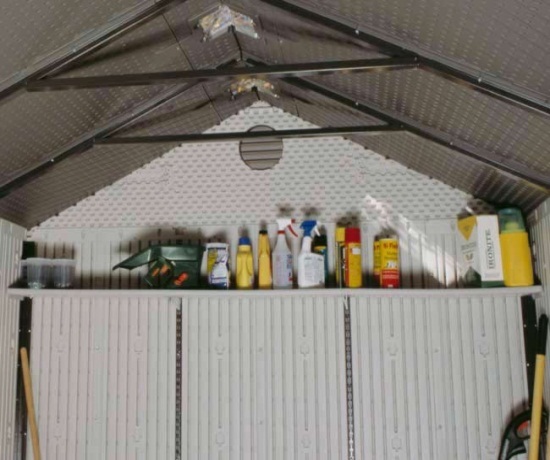 If your shed already comes with a full length shelve then you can only utilize three additional 0150 full length shelves. If you have any questions about this please let us know. Chair was new as described, looks and works great! I will be back for more. Thanks! Great company - fast shipping - wonderful experience - thanks!!! Great shelf to go with my Lifetime shed! This shelf is a great addition to my shed. Not only does it give me additional storage space, but it also lends strength and stability to the back of the shed! One came with my shed, and my storage needs were such that I ordered another one. Quick shipping and good instructions. Made for the shed, fits fine. A little pricey. Q: I relocated the shed and have the shelf but haven't located the brackets yet. Is it possible to obtain a pair? Q: Does this include the shelf brackets? A: Yes, all of the necessary mounting hardware is included. 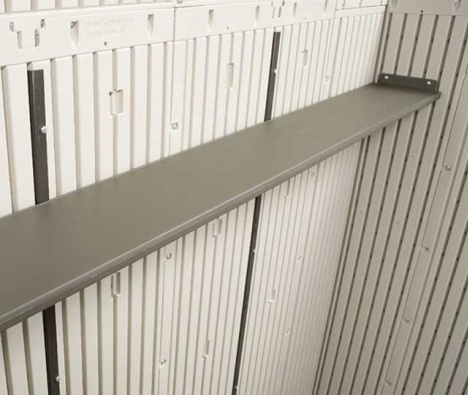 Q: Will this shelf system work in an eight foot Rubbermaid shed? A: This is for a Lifetime shed, and is not built to work for other brands. Q: Does this Shelf come in any other colors? Dimensions: 95" x 10" x 2"